Last year's mysterious outburst of deep-space light flashes was even more frenzied than previously thought, a new study reports. 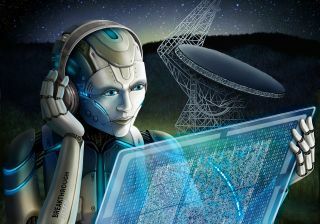 On Aug. 26, 2017, astronomers with the Breakthrough Listen project — a $100 million effort to hunt for signs of intelligent alien life — spotted 21 repeating light pulses called fast radio bursts (FRBs) emanating from the dwarf galaxy FRB 121102 within the span of 1 hour. And FRB 121102, which lies about 3 billion light-years from Earth, is particularly intriguing: It's the only known "repeater" source of FRBs, which otherwise tend to be one-offs. In the new study, Breakthrough Listen team members based at the University of California, Berkeley SETI (Search for Extraterrestrial Intelligence) Research Center applied machine-learning techniques to the August 2017 data set, which was acquired by the Green Bank Telescope in West Virginia and was originally analyzed using traditional methods. The researchers, led by UC Berkeley doctoral student Gerry Zhang, trained an algorithm called a "convolutional neural network" to spot FRBs among the 400 terabytes of data. The strategy is similar to that employed by IT companies to optimize internet search results, Breakthrough Listen representatives said in a statement. Zhang and his colleagues dug up an additional 72 light flashes, bringing the total number of FRBs detected on that day, from that single source (whatever it may be), to 93. An artist's illustration of a fast radio burst reaching Earth. The different colors signify different wavelengths of light. "In this case, it was smart, original thinking applied to an existing dataset," Worden added. "It has advanced our knowledge of one of the most tantalizing mysteries in astronomy." That mystery remains, of course; we still don't know what FRBs are. But the artificial-intelligence approach employed in the new study could lead to a variety of advances down the road, Zhang said. "This work is only the beginning of using these powerful methods to find radio transients," he said in the same statement. "We hope our success may inspire other serious endeavors in applying machine learning to radio astronomy." The new paper has been accepted for publication in The Astrophysical Journal. You can read a copy of it for free at the Breakthrough Listen FRB 121102 site.